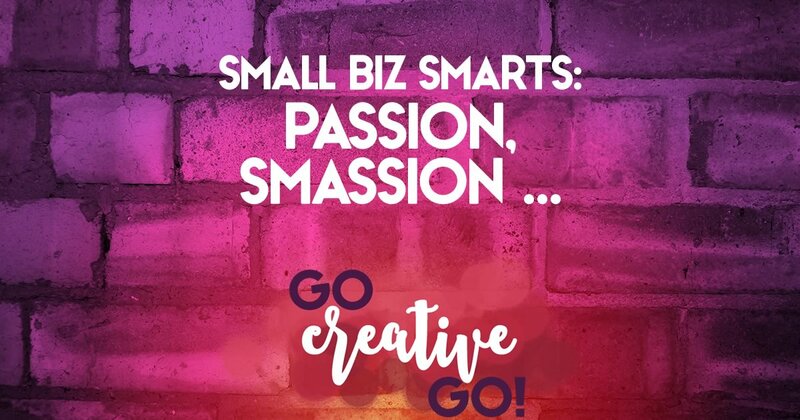 Small Biz Smarts: Passion, Smassion! Smashing! - Go Creative Go! Small Biz Smarts: Passion, Smassion! Smashing! I hope you see what I’m doing with the title. A little play on words when it comes to passion and small business. LOL. Before the negative commenting commences, I’m ABSOLUTELY not smashing passion as an important part of your business success. It IS important. But I would love to smash the myth that love for what you do is all you need to make a successful go of your product, service or other offering. but put in the EFFORT! I have a passion for tennis, but that alone hasn’t helped me rise to the challenge of playing against more skilled opponents. What has? I’m so glad you asked! Practice might not make perfect, but it can certainly make you feel more powerful. The more you engage in an activity, the easier it becomes. I didn’t immediately have a strong overhead (although my backhand slice did come quite naturally, LOL). I put in the time and effort to build technique, racket speed and consistency. I’m not talking about just hitting the courts and goofing off. I go to dedicated drills where I know I’m going to be put through my paces. You have to do the business drills, too. Come up with systems, test them out, and tweak them until they work almost by rote. Habits, both good and bad, take a while to develop. Practice really does make possible, if not perfect. Sure, you’ll swing and miss sometimes. But it’s practice that makes it possible for you to hit the sweet spot more often than not! You’ve Gotta IGNITE and IMPLEMENT! Passion can certainly warm up prospects, show your dedication to your craft, but it’s not enough to spark a sale. What have you got to light a match under anyone currently sitting on the fence? How are you passing along or paying forward that passion? What makes you stand out within the crowd of loved up on their business solopreneurs? The feels are great, but prospects and peers looking to collaborate want you to share the “reals,” the realities of what will happen if they choose to work with you. Love for business and awesome ideas aren’t going to get you anywhere without implementation. And that means putting in the work, dealing with the breaks and bust-ups (because no launch is hitch free), and delivering on what it is you love. Reality Rocks When It Comes To Small Business! The fabrication that it’s all superstar red carpet premiers, gold thumbtacks and glitter strewn artfully across our desks, unicorn kisses and pots of gold at the end of a rainbow? You bet your sweet bippy it’s THAT time! How about we share the joys of coffee spilled across keyboards, the frantic blotting with paper towels followed by blasts from our hair dryer? Isn’t it time to share the fact that we often stare at the window beside our desks and ponder the resounding crash of glass as our computer sails to the ground below? Glamourous? Right! Did you get in the shower today? Comb your hair? Brush your teeth? Running your business isn’t a ride on a soft, puffy cloud dancing across endlessly sunny skies. It’s more like a ride on a careening roller coaster, sans safety harness, hanging on tight as you never know which way it’s going to twist, turn and toss you about at any given moment. And, really, that roller coaster ride, while often unnerving, is what makes it all worthwhile in the end! If I see one more passionista posit that we need to remove can’t from our vocabulary, I’m going to punch her passionately in her perky little nose! Guess what? You can’t do everything. And guess again! If you pretend you can you’re going to let a client down when you fail to deliver. The necessary no is part of doing business. Nodding your head and numbly agreeing to take on tasks you have no time and/or talent for is a surefire way to set your small business on the road to crash and burn. Yeah, loving what you do can certainly make the solopreneur gig great. But the skills that pay the bills have little to do with love, and a whole lot to do with education, practice, willingness to work hard and the perseverance to push through the rough patches. http://www.gocreativego.com/wp-content/uploads/2015/11/GCG-pinnable-passion-smassion.jpg 1080 735 Mallie Hart http://www.gocreativego.com/wp-content/uploads/2016/07/GCG-sitelogo-new.png Mallie Hart2015-11-19 08:46:112016-09-20 13:03:15Small Biz Smarts: Passion, Smassion! Smashing! I agree, 100%! Passion is important, but it’s not enough. I’m passionate about designing websites and working on my own terms, but running my own business? Not a fan. I have to work hard for that. I’m constantly learning new things and testing out different ideas so I can continue doing what I love. And while passion alone isn’t going to keep me afloat, it is the driving force behind everything I do. Since I’m not too keen on the whole business side of things, I honestly can say that without my passion for design and working for myself, I would definitely not be putting in the effort to make my business work. It’s the dedication to the passion that is making my business a success. Not the passion alone. Couldn’t agree more, Allyssa. It’s about how you pursue the passion. Finding it’s great. But you’ve got to do something with it or who really gives a flying you-know-what?!?! Agreed! This also brings to mind those who go on about visualising success. You can visualise all you want, and you can be passionate as hell about what you do, you still need to do the work. Do the work. Do the work. Do the work. There really is no shortcut. Small Business Smarts: Make Time For Your MOST Important Client! Fake It ‘Til You Make It Is BAD Business!